rooftop, under the stars, four story’s high, overlooking beautiful East Mountain and Historic Main Street! At DeVito’s, you can always expect competent, gracious service. Stop in every day, November 12-15th to sample the best that DeVito’s has to offer! Eureka Springs is home to many great, independently owned restaurants. With many of the Eureka Springs restaurants concentrated in downtown Eureka Springs, it is easy to hop from one to the next as you explore downtown shops and attractions. Learn more about Eureka Springs downtown dining. Eureka Springs is home to Keels Creek Vineyards. There will be a Special Wine Event at Keels Creek Winery on November 14th. Keels Creek creates award winning wines. Keels Creek Winery received 2 bronze medals at the Sixth Annual Mid-American Win Competition in Ankeny, Iowa in 2012 and was hailed by the competition’s director, Bob Foster. “Consumers ought to track them down and enjoy them,” he said. 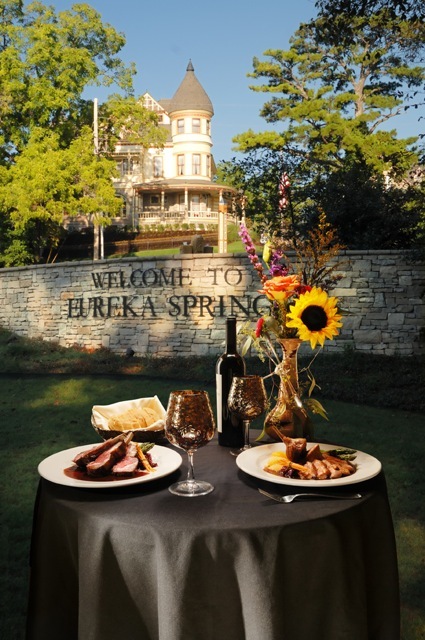 For more information on the Eureka Springs Food & Wine Weekend, visit them on Facebook. See a complete list of Eureka Springs Restaurants and check out Eureka Springs Nightlife and other great Eureka Springs Events. This entry was posted on November 4, 2015 by service424 in Culinary Adventures, Festivals, Fun Downtown, Things to Do and tagged Devito's, festival, food, Food & Wine, Keels Creek, weekend, Wine weekend.